Most of the cars shown at the Geneva Motor Show will be available for the public. They may be in price ranges that make most of us sweat but nevertheless they are all but ready for production and the road. Perhaps they’ll appear in a movie or music video? However what makes the show akin to Fashion Week are the exceptional high-performance concept cars. As opposed to articles for each of the concept cars and new tech shown at the Geneva Motor Show, we decided to just go ahead and do brief rundowns below. While few of these cars will lead to production vehicles, the innovation will have many practical applications and products that consumers can buy down the line. Hence, we will also be doing a rundown of some of the new tech from the show. Based on internet feedback, the new Bentley concept may actually have a shot at being a production vehicle. We have confirmation from Bentley that many of the aspects of this concept will inform the design of future, all-electric cars. All that being said, however, very few details were disclosed about this concept’s battery and range. However the main draw of the car was its unique aesthetic and design which Bentley representatives claim are meant to show that EVs do not “necessarily need to look like a refrigerator” (Bloomberg). As if VW was going to let something like a pesky Diesel Emissions Cheating Scandal stop them from showing off at Geneva (sorry that was catty), the “Sedric” concept made a splash. It is an SAE Level 5 self-driving plug-in electric concept car and an early test for their new mobility service. VW hopes that the Sedric will be an obtainable goal for the company with regard to their massive investments in self-driving tech, the on-demand taxi service Gett, voice control, and all new electric vehicle tech. Ok for every outrageous concept a few of these do have some chance of production either as a watered down model or via parts showing up in other cars. This won’t see either. It’s just a pure fantasy. The Trezor’s groundbreaking electric powertrain derived from Renault’s successful e.dams Formula E race car. That’s right, it’s not even street legal. And it utilizes the race car’s brake-energy recovery system. Packing over 349 horsepower and 280 lb-ft of torque, the rear-wheel-drive Trezor can hit 62 mph in less than four seconds, thanks to the carbon-fiber assisted 3527-pound weight. The Toyota i-TRIL concept car is a little different from what they showed off in Detroit and Chicago. This was revealed at the Geneva Motor Show and it is a 3-seater mobility concept that uses the new “Active Lean” tech, which does what it sounds like it does … allow the body and front tires to lean by up to 10° for stability (while the rear tires that are spaced close together remain perpendicular). One of the biggest points at Geneva was Realizing that the cars of the future will run on renewable energy. In addition to concepts and the top prestige cars, the press was also given a preview of the some of the most futuristic cars set to hit our roads sometime soon. For instance we have the Pop.Up, Airbus and Italdesign’s car-drone hybrid, but here are many more that got our haws dropping. Take the Hyundai’s FE (short for Future Eco) Fuel Cell. It is due for a 2018 release and is set to be the future of SUVs. Using Hyundai’s hydrogen fuel cell technology makes it a zero-emission vehicle, promising 30 percent greater energy density than the Tucson Fuel Cell. Tall the more notable is the unique, clean, flowing look that’s inspired by water, according to Hyundai. It even has an internal air humidifier system that can recycle some of its water emissions within the cabin’s atmosphere. As a bonus, the trunk can stow and charge an electric scooter. 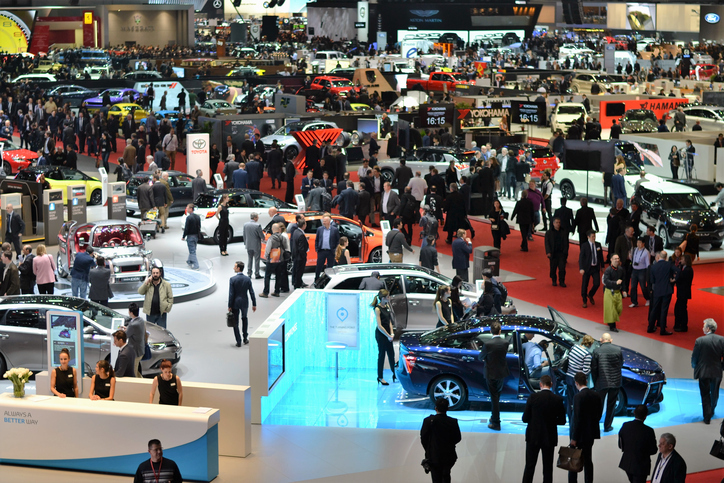 While electric powertrains and driver-assist features have been major overused buzzwords in the automotive world for years while now, this year’s Geneva International Motor Show actually got us interested again. And yet despite all the announcements there was a feeling that this year’s Geneva show that these concepts were actually due for mainstream production.